In the emergency zone, three ambulances are parked apparently in perfect condition. The perimeter seems to have witnessed a natural catastrophe: the area is desolate and the lack of people makes the deterioration of the dilapidated building more noticeable. 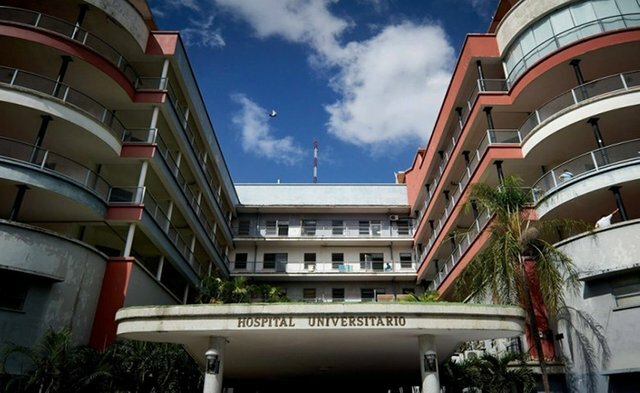 The University Clinical Hospital is located within the University City of Caracas, headquarters of the Central University of Venezuela, which makes its infrastructure a World Heritage Site since 2000. It is the work of the architect Carlos Raúl Villanueva and since its inauguration in 1956 he was a regional reference in health matters. It is the largest specialized medical center in Venezuela. A line of people stretches in front of the office in charge of dating control, under an intense atypical sun in a Caracas morning. The staff and patients along with their companions parade constantly through the different accesses of the hospital center except for the emergency area. In the emergency entrance there is a desk where the number one of the two members of the National Militia is standing guard, he is an old man, his gray hairs contrast with the darkness of his skin. A little more towards the bottom the other cash observes the screen of a small television that reflects the inaugural act of the soccer world cup Russia 2018. Inside the University Clinical Hospital (HCU) a group of workers organize a protest. The purpose of the demonstration is to address the General Prosecutor's Office of the Republic, demand compliance with the government's persecution of medical personnel and the release of Alfonso Román, a nurse who was detained by the Scientific, Criminal and Criminal Investigation Unit. CICPC) for 11 days. The nurse was after the CICPC, the Public Ministry of the Interior, Justice and Peace, allegedly found the medical instruments in the locker belonging to Roman. It is the second day of protests and the number of protesters is, in essence, less than yesterday, the heads of the different services have been in charge of the services and threats to avoid the repetition of the infraction of the first day, in which the staff in the company of the media, they entered the hospital and stationed themselves outside the Directorate in search of an official statement on the case of their work partner. Given the external pressure and the unexplained absence during the last month by the Director of the hospital center, María Antonieta Caporales, the Office of the Department of Nursing, Irma Gudiño, agreed to testify in front of the media. In his statement he wanted to vindicate the union, and expressed that the video was used as evidence by the CICPC was manipulated since it shows "the boxes of the general stores as giving a meaning that was the nursing staff that had all that hidden, which it is impossible for those packages to fit in a nurse's personal lockers. " The heat is unbearable inside the hospital room, perhaps as a consequence of the fact that most of the air conditioning system is damaged, contributing to the proliferation of infectious diseases, to the reproduction of bacteria and to the enhancement of unpleasant odors that come from the bathrooms after more than six months without the water supply in almost the entire hospital. A boy with a mask reads one of the informative billboards that says "today (June 14) we celebrate the world blood donor day", ironically the bioassay service of the HCU is in technical closure without having a type of reagent to perform laboratory tests with serology, an essential test when making blood donations, which detect the presence of antibodies in the blood. "Health is a fundamental social right, obligation of the State, which guarantees it as part of the right to life." The State will promote and develop policies aimed at raising the quality of life, collective welfare and access to services. All persons have the right to health protection, as well as the duty to participate actively in their promotion and defense, and compliance with the sanitary and sanitation measures established by law, in accordance with international treaties and agreements signed and ratified by the Republic. " Article 83 of the Constitution of the Bolivarian Republic of Venezuela. The opening of the world and ended the use of a militiaman the same electronic device to tune to a radio station, try several stations and when finally get his volume and sings: "By the corner of the old neighborhood I saw him pass, with the tumbao 'that the handsome ones have when walking'. A few meters from the emergency entrance, as if cut off from the world, a woman hugs and runs her right hand over the back of a teenager. The young woman has a tattoo on her face, and the woman who uses her hand as a natural painkiller seems to be his mother. A couple of people pass by her side with total indifference, while the young woman buries her nails in the left forearm of the woman. It is about a 15-year-old girl with 40 weeks of gestation who longs for the birth of her daughter or the end of the increasingly strong and continuous contractions that make her mother's arm appear bruised. Resides in the Barrio 70 El Parroquia El Valle and since early morning broke the source, immediately went to the Maternal Child "Hugo Chávez", the closest to his residence, where they said they could not attend because of not having an anesthesiologist, followed the Hospital Periférico de Coche where they regretted not being able to attend her because the obstetrician had had a family emergency and had to be absent. Now he is on the outskirts of the HCU without cash and without hope, the little cash he had had used to pay for the two previous taxi races, one of the nurses approached and after listening to his odyssey, informed him : "Here we can not help you either, we do not have water and the operating room is contaminated". The young woman did not have time to listen or worry, the pain absorbed all her attention, the mother's eyes were lost after following from the distance the path taken by the nurse, returning from her lethargy she asked another young woman to relieve her while she was trying to get a taxi that accepted the payment via transfer. He approached five different taxi drivers and none agreed to take her with that condition they demanded cash and a very high amount. Desperate and with tears in her eyes she asked the drivers of the three ambulances if they could take her to the Maternidad Concepción Palacios, the answer was the same: "they could not move, unless they received an order from the hospital management". The driver of the last ambulance consulted with an obvious Cuban accent shouted towards a telephone stand and trinkets nearby: - ​​Hey you, head and 'motor, boy give charity to this lady that the girl is already going to give birth. Immediately a tall man ran to a double-cabin pick-up truck, quickly ignited it and brought it to the woman in labor. The back of the truck was full of empty bottles of a well-known brand of soft drinks, with the help of his mother and the other girl, the woman in labor got up by squeezing her small belly as if trying to inform her daughter that there was still more. The man took out some cardboard boxes from the back and lined the whole seat of the back cabin, where the woman in labor went to bed. The mother skirted the van, opened the door opposite the one from where her daughter had gone, raised her head and informed the driver that they could leave. The driver maneuvered to straighten the truck and put it in the right direction and accelerated. While the car was moving away the mother of the woman turned her face and focused her eyes on the emergency area where the three ambulances were left, apparently in perfect condition. Congratulations @cesar.pinto! You received a personal award!